When you seek the ultimate in convenience, while at the same time taking advantage of a resort-style atmosphere, this 2-bedroom townhome is located in the heart of a modern complex, 300 meters from Chaweng Noi Beach and coming equipped with hotel-style facilities that include a large communal swimming pool and Jacuzzi, alongside 24-hour security. This villa sleeps 4 people and is located next to the estate’s communal swimming pool. Sit back on your outdoor terrace and take in the tropical surroundings. The main living space contains a lounge with a wicker sofa, TV with international channels and a DVD player. In this area you will also find a cozy kitchenette and a breakfast bar area that can adequately seat 4 people. There are 2 bedrooms in the villa that both come with air-con and wooden wardrobes, sleeping up to 4 people in total. The master bedroom comes equipped with a king-size double bed, and there are twin beds in the guest bedroom. 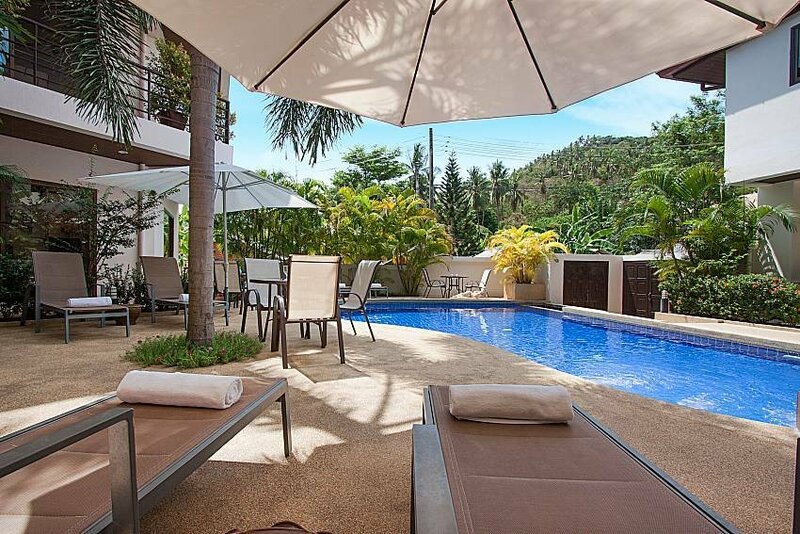 The location of this villa is one of its most exciting features, a short walk to Chaweng Noi Beach and also to nearby bars, restaurants and shopping options. The main Chaweng area is also a short distance away and is known as the busiest and most desirable tourism area on the island with a fantastic array of international eateries and an exciting nightlife environment. Other services and features included in the rental price are daily maid services, fresh towels and bed linen, a safe and Wi-Fi internet. For a larger group of friends you can book a total of 5 2-bedroom villas and 4 1-bedroom apartments.